Available in four convenient sizes that cut pipe from 1-1/2 to 20 inches, these pipe beveling tools are the perfect size for cutting any pipe or tubing. 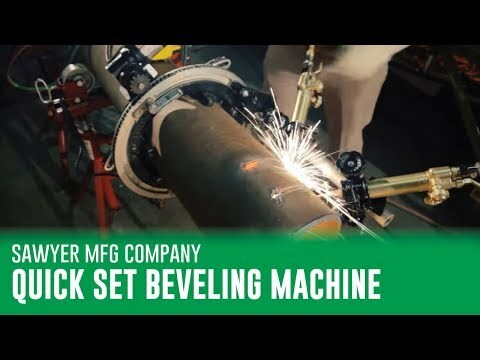 The unique sliding adjustment arm of the Sawyer pipe beveler requires no dogs or spacers, and the innovative split frame design allows it to be installed over the end or top of a pipe, providing perfect pipe cutting and beveling every time with minimal preparation, saving time and money. The Sawyer Quick Set saddle machine is in a class of its own among pipe beveling tools. Made with precision cast aluminum and featuring a fully enclosed gearbox that prevents damage to gears or pipes, the Quick Set pipe beveling machine is designed with rugged, yet lightweight, durability in mind. Simply put, this pipe cutting machine is manufactured to last when put through its paces in the field. No matter what size or material you need to cut, the Quick Set pipe cutter can handle it quickly and conveniently, and the five optional accessories guarantee this pipe cutting machine will meet any requirement. The Adjustable Torch Holder is capable of preventing blow holes by permitting horizontal adjustment of the torch, rather than the entire pipe beveling machine. This torch holder allows for thousands of positions and is ideal for seasoned welders. The Classic Torch Holder provides a simpler solution to the Adjustable Torch Holder, allowing quick and easy setup, preventing inaccuracy. The Double Cut Torch Holder allows two torches to be cutting and beveling simultaneously to save time, and egged pipe can be evenly cut with the Out of Round Attachment. The Quick Set comes standard with manual operation, but an optional Motorized Kit provides the fastest beveling motor in the industry. When you need perfect cuts every time, there’s no better pipe beveling tool than the Sawyer Quick Set saddle machine.